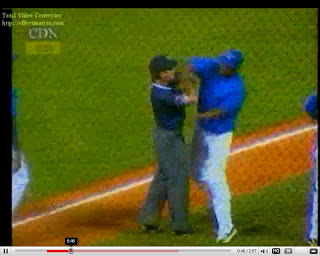 Did you see the video of Jose Offerman punching an umpire in a Dominican league game? An act for which he is now banned for life from the league? I've watched the video a bunch of times. I'm no Marv Albert, but it looks to me like Offferman never landed the punch. In fact, he didn't come close - missed by six inches or so. From point blank range. The ump's head never twitched and a noticeably long moment after the swing he fell backward on his rear. Watch it. The whole thing almost looks staged, like a cheap WWE move. Here is a freeze frame. You can click the image for a larger view.